As with most fabrics, you can go either high- or low-end with lace. The best stuff is French, and genuine French Chantilly lace has a little fringed border on the scallops, which I just love. (For close-up pics of lace, check out B&J's gorgeous selection.) This starts at around $60 a yard, but imitation Chantillys can be had for cheap, in the under $10 range. French lace is woven on shorter looms than most fabric, and so it's generally 36" wide. Cheaper varieties come in standard fabric widths. The lace is generally made of nylon, or sometimes silk for the really pricey stuff. You can burn a hole in it with your iron faster than you can say Chantilly. Always use low heat (no steam!) and a silk organza press cloth. 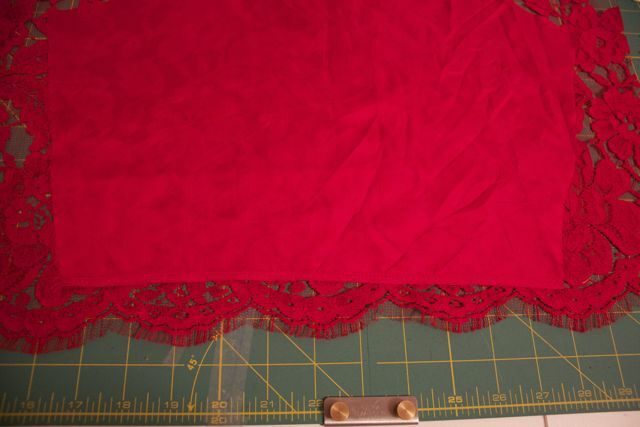 Lace can be stiffly starched when you buy it. I soaked mine in cold water with Soak Wash and then dried it flat. It came out nice and soft rather than stiff. For more info on lace, I highly recommend Susan Khalje's article "Amazing Lace" in Threads #124 and the lace chapter in Claire Shaeffer's Fabric Sewing Guide. Susan Khalje recommends using an underlay for Chantilly lace, because it's so fragile on its own. As you may imagine, one of the biggest challenges with lace is planning your design. Heck, just choosing an underlay color can be paralyzing for some people. (Not that I'd know anything about that.) Lace combines two distinct challenges: working with sheers and working with a border print. But both of these qualities offer exciting design opportunities as well. There are lots of questions to ask yourself: how will you deal with facings? Where should you use French seams? What if you want a sheer look—you could bind off the neckline and wear a slip underneath. There are so many possibilities! Next, position the underlay on your lace. This is an opportunity to take advantage of the design! I applied my underlay so that the larger floral patterns appear around the waistline, and then the scallop gets cut off. 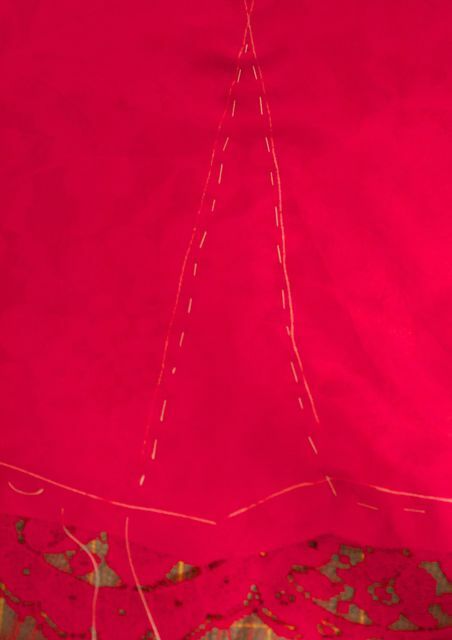 Using silk thread, baste the two pieces together just inside the seam allowances. Also baste up the legs of the darts, just inside the markings. 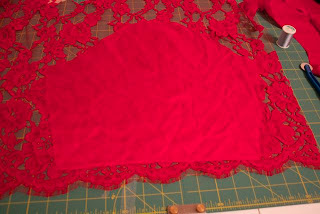 Cut out the lace around the underlay piece. Now treat it as one piece of fabric. The sleeves are a little different. 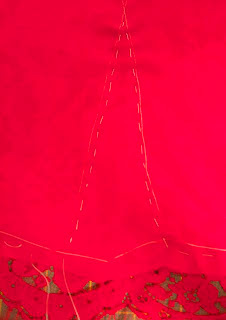 Because I'm positioning the scallop at the hem of my sleeve (negating the need for a hem), the underlay will need to be finished separately. First, I narrow-hemmed the underlay. 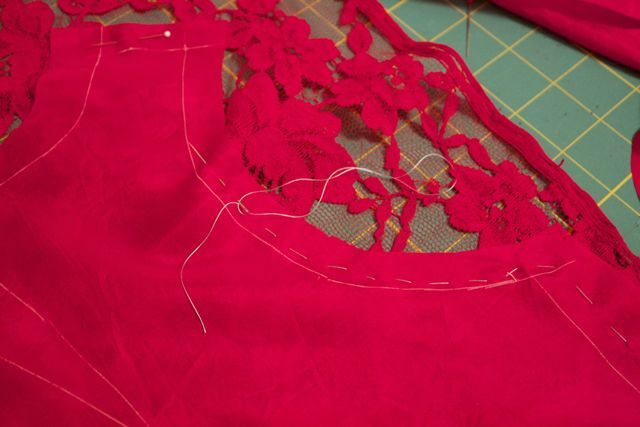 Then place the sleeve on the lace where it looks prettiest, using your keen aesthetic sense! 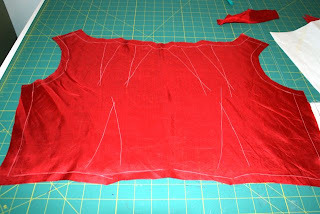 Repeat the basting and cutting process that you did on the bodice pieces. Here it is from the right side. Pretty, huh? I used a French seam in the under sleeve seams to avoid a messy look. 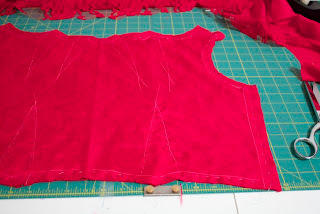 I'll do the same on the skirt pieces, since I'm keeping them separate rather than underlined. 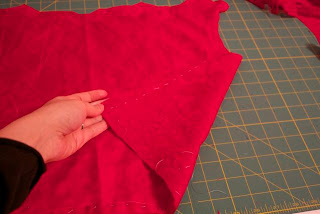 The bodice got regular old hems and I'll be lining it to cover up the innards. That's it for now! I'll show you more as I go along. Gorgeous! 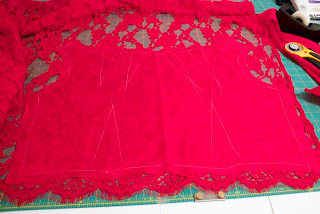 I've just finished a dress with a lace top and working out how to finish it was a real challenge (I didn't use an underlay and left it sheer - what a headache!) Finally I bound the edge but next time I'm going to try something a bit more fancy. A few years ago, Threads had an article by an FIT teacher who works/worked as as lingerie designer. She explained how to make a camisole with an expensive lace (over $100 a yard) overlay or insets. 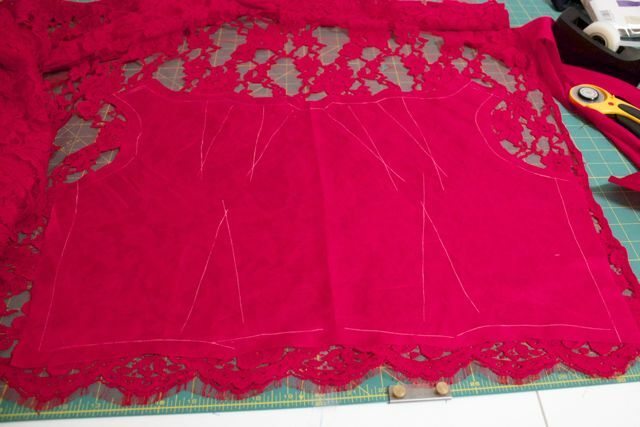 To protect the lace pieces, she photcopied them and used them while planning the layout of the lace. 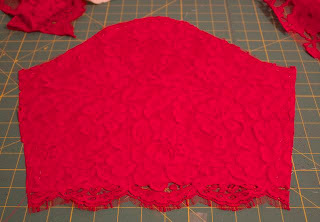 Your project is less complicated because it's a couple of big pieces of lace with the scallops at the hem. It is, however, an interesting trick to know. This was one of the nicest garments I've ever seen in Threads, and one of the best styled. That's beautiful. You make it sound so simple that I want to run out and buy myself some lace to make a lace dress. Somehow I don't think it would turn out very well. By the way, do you just use a regular straight stitch to sew the lace? Gertie, you're such a bad influence! Now I'm day dreaming about a lace sewing project! haha. I really, really appreciate the time you take to document how you do this, as well as share tips for handling a seemingly daunting and tricky fabric. (That really isn't that difficult now that I've read this--it just requires a few more steps and basting!) I'm really excited by the idea of using lace a bit more. 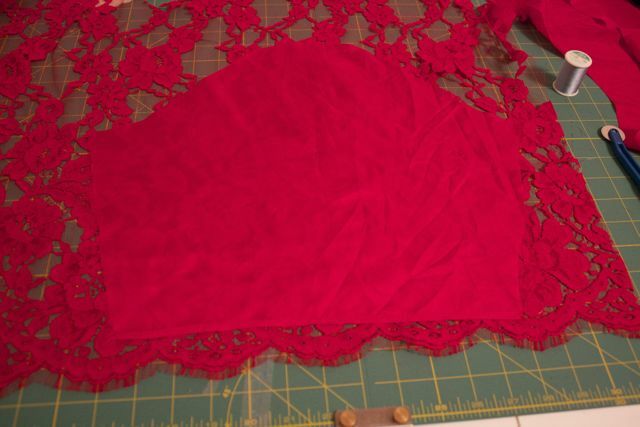 I recently got a book on lingerie making, and have been toying with the idea of using some lace for some pretty under layers. I shall have to keep your post in mind when I get down my sewing list a bit! I'm completly blown away at this point. I've never even considered working with lace, but your post makes me want to. Can't wait for the rest of your lace posts. Thank you so much for this. After reading your other posts about lace, I have come to the conclusion that I mist make a dress with lace- and now I know how to start! Ooh perfect timing - a couple of hours ago I found a really pretty, super cheap (£6/metre), and reassuringly substantial black lace in the fabric shop at my local market. I was going to look up tips for sewing with lace, but you've saved me the trouble - thank you! So funny, when I opened my blog this morning that little lace number made me gasp... I think the last time I did that was during a werewolf shirt off scene in one of the Twilight movies. That little dress is beautiful! Gertie, I hope and pray you never tire of sharing these tutorials, you make it so simple and easy to follow for us at home sewers! This article came just in time for me, planning on making a little lace bodice for myself and not quite knowing where to start...will definitely check out those articles, thanks! You write such clear explanations! Really, so good. This dress is going to be fantastic! This is going to be a KNOCKOUT of a dress! I work with (ivory, white, blush etc..) lace at my bridal dressmaking job and I forget how amazing it can be in colour!!! My friend at www.madebyjulianne.com. 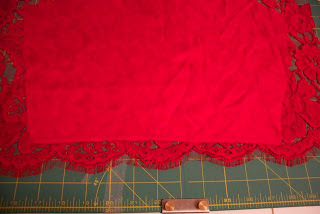 Suggested your site as I am attempting to fabricate a lace dress for an upcoming event. It was extremely helpful and inspirational. Great project; I love your clear explanations! I work with vintage lace in my fabric sculptures, but not in my clothing projects. You make it seem so easy that I just might try making a lace garment. A friend attended Susan Khalje's workshop to make a lace dress. There was muslin used as the underlayer sandwiched between lace/silk and actual lining. It was a beautiful dress with substance. It looks beautiful so far! This may be the perfect dress for your black tie event! Just wanted to let you know what we liked your tutorial so much that we posted a link from the McCall's Patterns facebook page. Please let us know when Part 2 is posted so we can add another link. Thanks. I was just poking through some of your older posts and found this one, and felt a need to leave you a comment for the first time. 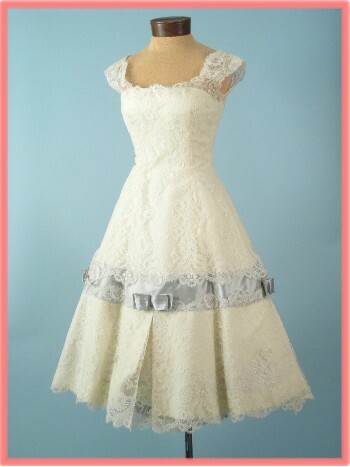 I have that vintage dress! I bought it to wear in my wedding, but didn't lose enough weight to fit into it. Never having the heart to part with it (it was my dream wedding dress after all!) it's been hanging unworn in a closet for close to 5 years. It came with the original petticoat pinned inside, and the only tag reads "Chantilly Lace: Made in France." Your link provided a bit more info as to its origins. So anyway, thanks! Thanks for this post Gertie. I am going to attempt lace and underlining for the first time this week and have been going over the technique in my head. I will be hand basting like you have. This will be all trial and error for me!!!! Thanks for a nice guide. Is there also a part two? The name implies that there is a continuation.